This easy Instant Pot Cilantro Lime Chicken recipe cooks up easily in the pressure cooker with simple pantry ingredients. Comes together quickly in a zesty and flavorful cilantro lime marinade perfect for grilling or baking. Quick and easy Instant Pot dinners are my go-to during the busy school week. Ever since getting our Instant Pot a few years ago, it honestly still remains the most frequently used appliance in our kitchen. I love that I can get dinner on the table quickly without having to plan ahead. 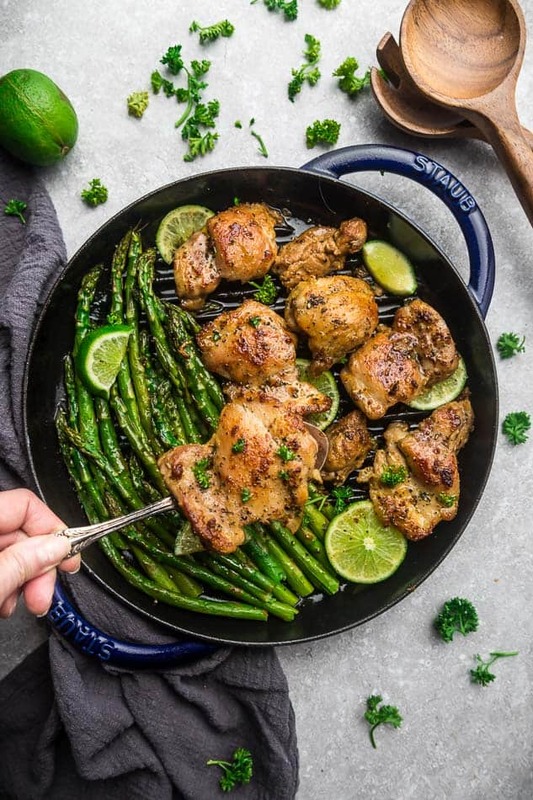 This Instant Pot Cilantro Lime Chicken cooks up tender, flavorful with simple ingredients you probably already have in your fridge. What I love about one pot recipes like this is that clean up is a breeze! Everything comes together using your pressure cooker (or a skillet) in a delicious cilantro lime marinade. Not only is this recipe extremely quick and simple to make, it’s now become a part of our weekly dinner routine. Plus, my family is just crazy about the tasty combination of cilantro and lime together. IS CILANTRO LIME CHICKEN HEALTHY? 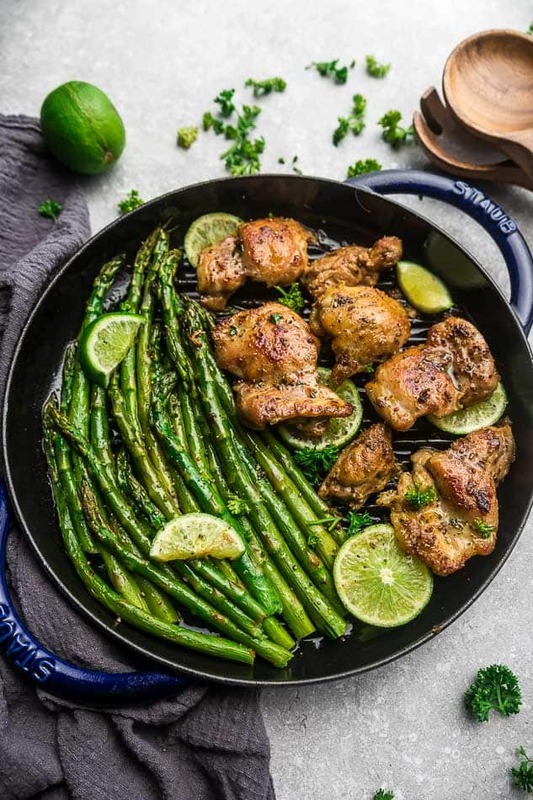 For this one pan cilantro lime chicken recipe, there is no added sugar and very minimal carbs so it fits great into a healthy and balanced lifestyle. To begin, you’re going to season the chicken with salt, black pepper, cumin and chili powder. 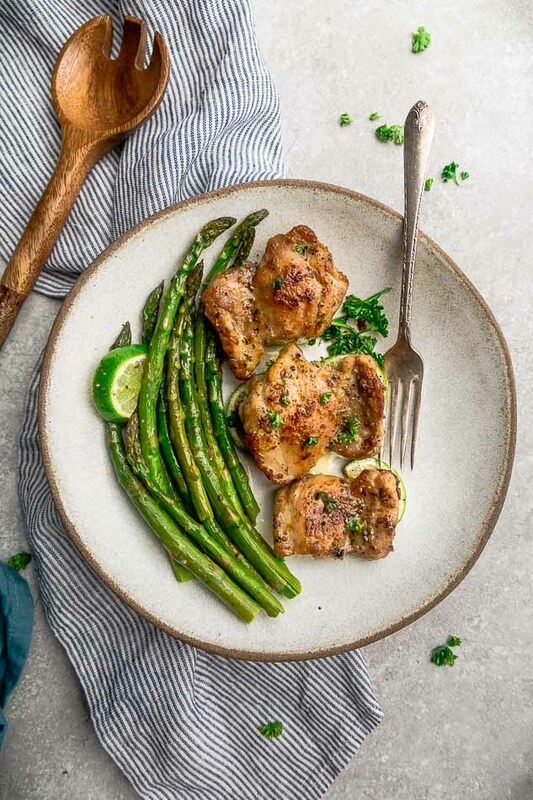 I used chicken thighs here because I love that they stay tender but you can also use pounded or halved chicken breasts and they’ll still turn out delicious. Next, you’re going to brown the chicken in the Instant Pot using the sauté function. Searing the chicken helps to seal in those amazing juices and gives the chicken that extra layer of flavor. Transfer the chicken to a plate then add the ghee, onions, garlic, lime zest, lime juice, cilantro and chicken broth. Seal the lid on and let your pressure cooker do the rest. **NOTE: I have the 6 Quart Instant Pot Duo and have NEVER HAD an issue with adding the amount of liquid called for in this recipe but if you do get that “burn” message, you can certainly try adding more liquid. 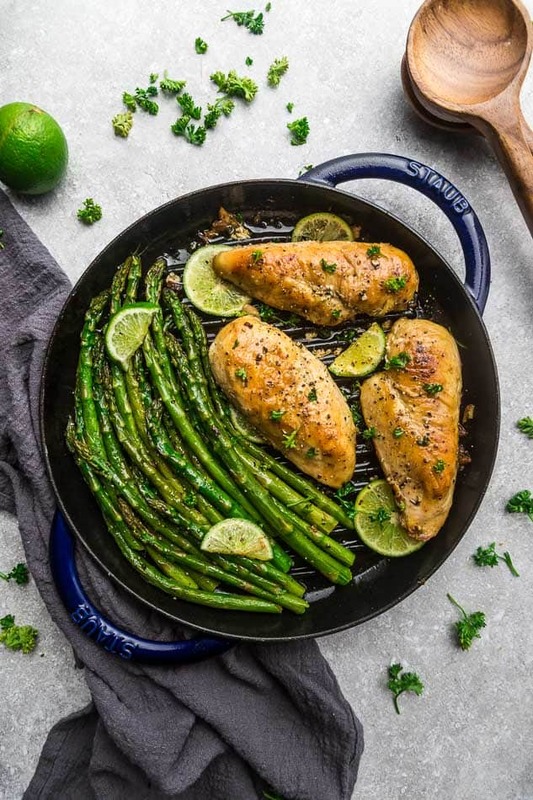 HOW DO YOU MAKE CILANTRO LIME CHICKEN IN A PAN? Season the chicken with salt, black pepper, cumin and chili powder. In a medium-sized skillet over medium-high heat add avocado oil or ghee and cook for 4-5 on each side, or until chicken reaches 165 degrees. Transfer browned chicken to plate and set aside. Return pan back to heat and melt ghee. Stir in garlic, onions, followed by the lime juice to deglaze the pan and cook for 1 minute. Add lime juice, lime zest, cilantro and chicken broth. Stir in coconut cream [if you like your sauce thicker – you can thicken with xanthan gum if desired or a cornstarch slurry (if not low carb) or arrowroot starch slurry by mixing 1/2 teaspoon cornstarch (arrowroot starch) mixed with 1 teaspoon cold water]. Once the sauce has bubbled and thickened up slightly, stir in coconut cream and and add the chicken back into the pan until hot. Spoon sauce over chicken and sprinkle with chopped parsley. Serve with your favorite sides and garnish with lime, if desired. IS CILANTRO LIME CHICKEN FREEZER-FRIENDLY? Yes, this instant pot chicken would be great for Sunday or Monday meal prep. Jut store the chicken in an airtight container either in the fridge for 3-4 days or in the freezer for up to 3 months. WHAT SIDES CAN I SERVE WITH CILANTRO CHICKEN? 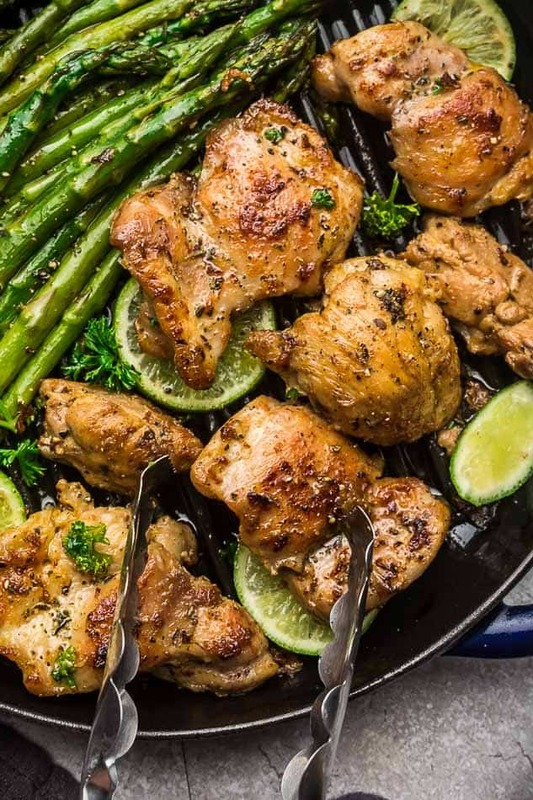 You can serve this healthy cilantro lime chicken with pretty much any sides you like. 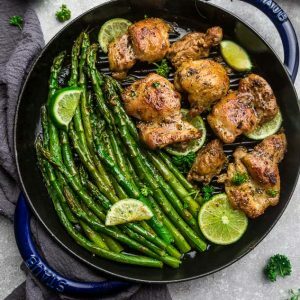 You can see we paired our instant pot creamy cilantro lime chicken recipe with asparagus since it’s one of my favorite spring vegetables but roasted broccoli, zucchini, green beans or cauliflower would be delicious as well. Season the chicken with salt, pepper, garlic powder, cumin and chili powder. Place chicken in the Instant Pot and cook on each side for 2-3 minutes, or until golden brown. This helps to seal in the juices and keep it tender. (You may have to work in batches depending on the size and amount of chicken you are using). Once browned, remove from Instant Pot and set aside. Melt ghee in Instant Pot and stir in the onions and garlic. Add lime juice to deglaze pan and cook for 1 minute. Add Italian seasoning, lime zest, cilantro and chicken broth. Place the chicken back into the Instant Pot, lock the lid, and turn the valve to SEALING. Select the Manual (older models) or Pressure Cook (newer models) button and adjust the timer to 7 minutes. It will take about 5-10 minutes to come to pressure and start counting down. When done, release the pressure after 2 minutes, then remove your Instant Pot lid. Remove chicken from Instant Pot using tongs and set aside on a large serving plate. Stir in coconut cream into the Instant Pot. If you like your sauce thicker - you can thicken with 1/2 teaspoon xanthan gum (OR if not low carb a cornstarch slurry or arrowroot starch slurry by mixing 1/2 teaspoon cornstarch (arrowroot starch) mixed with 1 teaspoon cold water). Press off and turn Instant Pot to SAUTE function. Cook and allow the sauce to bubble and thicken. Turn off and add chicken back to the Instant Pot to coat with sauce. Spoon sauce over chicken and sprinkle with chopped parsley. Serve with your favorite sides and garnish with lime slices, if desired. In a medium-sized skillet over medium-high heat add olive and cook for 4-5 on each side, or until chicken reaches 165 degrees. Transfer browned chicken to plate and set aside. Return pan back to heat and melt ghee. Stir in onion and garlic. Add lime juice to deglaze the pan and cook for 1 minute. Add Italian seasoning, lime zest, cilantro and chicken broth. Stir in coconut cream [If you like your sauce thicker - you can thicken with 1/2 teaspoon xanthan gum (OR if not low carb a cornstarch slurry or arrowroot starch slurry by mixing 1/2 teaspoon cornstarch (arrowroot starch) mixed with 1 teaspoon cold water). Once the sauce has bubbled and thickened up slightly, add the chicken back into the pan until hot. Spoon sauce over chicken and sprinkle with chopped parsley. Serve with your favorite sides and garnish with lime slices, if desired. *For chicken breasts: use 3 breasts, sliced horizontally in half. We loved this! Thank you! I love easy dinner recipes, especially when they turn out to be something my whole family loves!. This one also looks tasty. this is literally one of the most delicious things I have made! thank you for the sharing a great recipe! !